When the postcard album was first entrusted to me, I was most interested in reading the notes scrawled to my granddaddy, Donald C. Minor, a young child while collecting the 1906-1910 cards. My head just buzzed with research fever as I tracked names and postmarks. With each read of the cards, I noticed new details about the notes and the cards themselves–their designs, cryptic publisher symbols, the artistic renderings. Before I knew it I had joined the ranks of international deltiologists who collect and preserve these beautiful postcards. Over the weekend I finally completed the task of sorting the collection into protective acid-free sleeves. With a satisfied sigh, I thumbed through the thick portfolio, plotting my next scan and publish strategy. 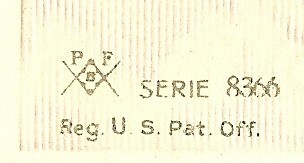 I was drawn to the cryptic symbol found on several Easter cards, and went googling for some explanation of this publisher’s trademark. Fortunately I it was a EUREKA! kind of day, and I stumbled upon a German site run by Helmfried Luers, The Postcard Album. Mr. Luers has a whole section of his site dedicated to uncovering the meaning of this symbols! These chromolithographic cards were published by Paul Finkenrath, Berlin, Germany in 1909 and 1910. Mr. Finkenrath, a successful chromolitho printer, established his postcard publishing house in 1897, successfully exporting quality chromolith cards that met the consumers’ demands for affordable postcards. He closed his business around 1911 as competitive forces and protective tariffs made the production of postcards less lucrative. Congratulations, Kay, on completing the preservation!